Super Savings Item! Free Shipping Included! 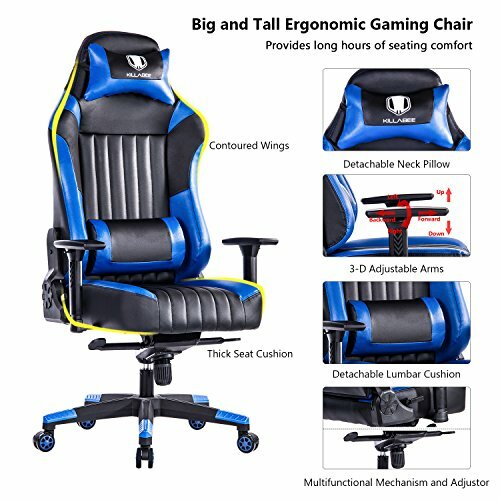 Save 34% on the KILLABEE Big and Tall 440lb Gaming Chair - Adjustable Tilt, Back Angle and 3D Arms Ergonomic High-Back Racing Leather Executive Computer Desk Office Chair Detachable Headrest and Lumbar Support, Blue by KILLABEE at RVTE. MPN: KB-8212-Blue. Hurry! Limited time offer. Offer valid only while supplies last. A Swivel Chair Or A Racing Car Seat? KILLABEE presents you with the revolving gaming chair, a swivel chair that has the design of a racing car seat. A Swivel Chair Or A Racing Car Seat? KILLABEE presents you with the revolving gaming chair, a swivel chair that has the design of a racing car seat. It is the perfect chair for passionate gamers, but also for office workers who wish to be more comfortable while they work. The ergonomic computer chair with the high density foam, the high backrest and the wide armrests will become your favorite piece of furniture. Adjust Every Single Part For Extra Comfort! This gaming chair is multifunctional, and this is one of the many reasons why it is so great and comfortable. Are you not convinced yet that this is the most advanced and comfortable office chair that you'll ever sit on? Built To Last And To Be Cool And Grand! This gaming chair is made with quality materials that will never bend, break or malfunction. It's sturdy, stable and durable. It's made with an integrated frame, a heavy duty base, an explosion-proof gas spring and smooth-rolling casters. Overall size: 27.6" x 26.4"x 51.2"- 53.5"
Seating area: 21.7" x 20.5"
KILLABEE offers you a 1-year warranty and a 100% satisfaction guarantee. So if there's anything that malfunctions or if you're not happy with your purchase, contact us and let us know. We will take care of the rest! So Don't Hold Back! Click The "Add to Cart" Button NOW! ★ 【THE MOST COMFORTABLE CHAIR】 - Upgrade your gaming experience with this ergonomically designed racing chair. You can now play your favorite games or work in your office and be comfortable all day long. The rocking high back and the wide armrests will hug every curve of your body and provide you with unbelievable comfort. The high backrest with detachable padded headrest and lumbar cushions will also support your neck and spine, so that you won't have a "computer hunch"